London South Bank University (LSBU) has been a member of the UK Green Building Council (UKGBC), the charity and membership organisation campaigning for a sustainable built environment, since 2014. 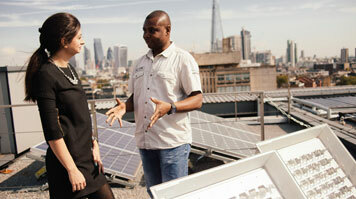 “It’s great for LSBU to be a member of the UKGBC – it formalises our commitment to inspiring best practice and leadership when it comes to sustainability, it complements the research and teaching facilities that we have in the School and also gives us access to a network of other organisations who share our vision of a sustainable built environment sector. “Looking at our facilities, students get plenty of exposure to the technologies and processes which the sector will need to embrace in order to provide sustainable buildings for the future. For example, the £2.8m Centre for Efficient and Renewable Energy in Buildings (CEREB) hosts many different renewable and intelligent energy solutions, and allows developing technologies and new products to be trialled a real life setting, where the results can be closely monitored. It is an invaluable resource for understanding how to design, operate and manage technologies for future low carbon buildings. “In addition to cutting-edge facilities, students also benefit from high-calibre teaching around sustainability. Myself and many of my colleagues have a professional background in sustainability, and it’s common practice across the School for us to provide up-to-date knowledge from industry as part and parcel of the courses we deliver. “Being a member of UKGBC further boosts our sustainability credentials when liaising with employers. This year we enabled students to take advantage of CPD opportunities at Saint-Gobain, a leading provider of sustainable construction materials to the construction supply chain, and we have other partnerships and projects in the pipeline, to ensure that our graduates are ahead of the competition when it comes to applying for jobs. Find out more about sustainability in the School of The Built Environment and Architecture at LSBU.